If you're looking for a cabin or some other lodging on Joe Pool Lake, you've come to the right place. 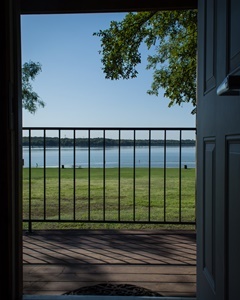 This page has some great places to spend a weekend or longer in some unique waterfront lodging rentals on Joe Pool Lake. 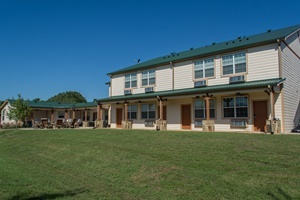 Loyd Park at Joe Pool Lake offers a variety of overnight stay options. Tucked away in the DFW area, Loyd Park is a great retreat conveniently located near other fantastic tourist attractions. If you are interested in camping, Loyd Park has 213 huge, private campsites with concrete pads to choose from and you'll find a mix of sites - some full hook-up, others water and electric, and some 30 and/or 50 AMP. Other amenities available at each site are table, grill, picnic pavilion and fire ring! 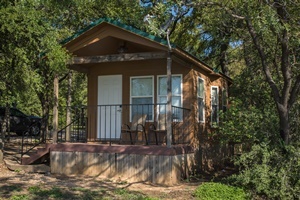 Loyd Park also has 9 Cabins to choose from, if you are not interested in tent camping. These cabins vary from 1 to 3 bedroom, are fully furnished, and have plenty of amenities to accommodate your stay. Several of the cabins are within 100 yards of the Lake. During your stay you can enjoy the lake for swimming, fishing, or boating: rent kayaks, canoes, or paddle boards; play volleyball or softball; hike, bike or ride horses on any of several trails. 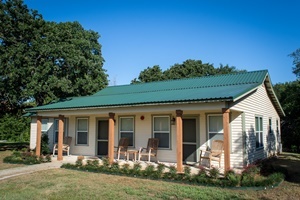 A final option you have when looking to stay at Loyd Park is the Loyd Park Lodge. This 18-room lodge is perfect for family reunions or retreats. Including a fully furnished kitchen, TVs, grills, fire pit and more, this lodge is a great place to get away and enjoy a comfortable stay in a gorgeous setting. To learn more, read Texas Outside's Review of Loyd Park, which is rated as one of the Best Campgrounds/RV Parks in Texas.